Next day: Look how they have grown! 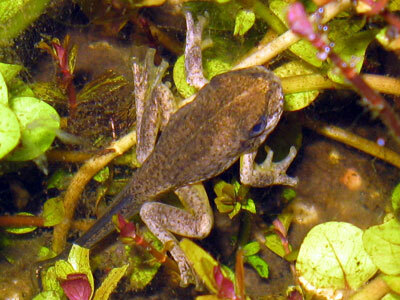 At this age the Peron’s tadpole often looks clear in between their stripes. Tadpoles eat all the time! This fellow is enjoying the leaves of an aquarium water plant. They will also thrive on bits of lettuce which has been boiled or frozen and aquarium fish flakes. 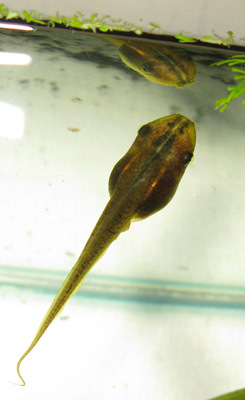 At around 6 weeks old, the same tadpole is much bigger and has lost those clear parts on his body. He is now yellow brown all over and quite likes looking at his reflection. Little legs are starting to develop and he is eating more than ever. This morning I found this metamorph resting on the lily pad looking very much like a frog. Not much tail now and I expect he will leave the pond area very soon. He has been sitting there all day and I have been worried a bird would get him, or Whisper. HEY! those are the tadpoles that i just caught! thanks for putting this on cause u’ve helped me find out the species of my little taddies. I’m pleased my page has helped you ID your tadpoles. There is a great guide book for identifying tadpoles which you may be able to pick up at your local library – Tadpoles of South-eastern Australia by Marion Anstis. I found it very useful but usually find it easier to ID once the taddies have morphed into frogs. those are cute tadpoles! We are at school and we are raising some of our own tadpoles, isn’t that cool!!!!!!! Yes raising tadpoles is cool and very interesting. I hope you are taking lots of pictures at school so you can show everyone the change from tadpole to frog. Perhaps you can make a PowerPoint presentation or a Smartboard interactive whiteboard notebook ( if you have those boards at school). Does your school have a website? That is another way to share the experience with your school community. I just found polywogs at a lake near my grandma and grandpa’s. Now I’m learning about frogs and polywogs. Thanks for your webpage. It’s a great one! This was very helpful! Did your frog stay around or leave and return? I was told they stay close to the pond. A few stayed. I find them occasionally when gardening. The ground frogs do stay close to the pond but the tree frogs seem to roam more. I have one from this batch of tadpoles living in my hanging pot. Hi, i found some tadpoles in a bucket in the back yard. i m not sure if ther frogs or not? could u help me out and if they are frogs how would i take care of them. Thanks for creating this page. It’s been helpful in trying towork ouy the approx age of the tadpoles in our pool. There would be over 100 in out backyard pool. You can just take them out and keep them in a jar (do not overcroed jar) until they start to develop legs. Feed boiled lettuce or fish flakes. Release into a lake or dam with plenty of vegetation ! Alex has the right idea. I would use something bigger than a jar for that many taddies. I doubt you could save and feed them all unless you have a garden pond with no fish. Try using a big plastic storage box. I saved some from a friend’s pool once. Very hard to catch them all. I used the pool net to scoop up some but found a small bucket worked as well where the tadpoles were resting in the shallows. We managed to save about 90% of them. I reckon there’s a few hundred at least. I bought 2 inflatable pools to keep them in temporarily. So far they’re thriving and a lot have developed back legs. I’m feeding them frozen lettuce and fish flakes but not sure how long they eat that for before movoing onto something else! Fish flakes and boiled lettuce will be fine. I find they stop eating as they begin to morph and absorb their tails. Next on the menu will be your backyard bugs! Make sure they are able to climb out of the pools, that they have hiding places close by… rocks, foliage etc to hide in and keep the surrounding areas moist for them. I often put bits of cut up fruit and peel in the leaf litter around my pond to attract extra food for the the little frogs. Thank you for this informative site. I live in Raleigh, NC and am also trying to keep alive nearly 100 tadpoles in my back yard – some are living in the rainwater caught by the tarp on my boat, the rest, I moved to a large bucket. Is that OK? Do they need to get fresh water added every now and then to keep oxygen levels up and waste levels down? Any other advice aside from feeding them fish flakes and boiled lettuce? Also – do you need to chop up the lettuce small or not? Yes, you definitely need to give them some fresh water every other day. Try not to keep too many together. I’ve read that tadpoles secrete something that will inhibit the grow of others in crowded conditions. The only advice about the food is not to give them too much at a time as rotting food will foul the water. I don’t bother to chop the lettuce… just crush it a bit. Sometimes it is better to have a small number of healthy tadpoles than save the 100s. I couldn’t say without seeing a photo of one. 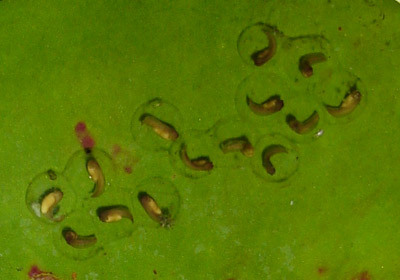 Tadpoles don’t have to be black. Most of mine are light to dark brown. I have an old bath tub in my paddock that is usually used to water horses I noticed a month or so a few tadpoles (the number sighted increased to about 80). the only time it gets a refill of water is when it rains here. I now have a few with front legs, I am feeding them once a week with fish flakes but mostly I watch and enjoy them. Maybe you will be able to identify the morphs when they leave the tub. I sometimes put a couple of tadpoles that have reached this stage in an enclosure so that I can better identify them when they morph. I always release them to the same pond after a couple of weeks. 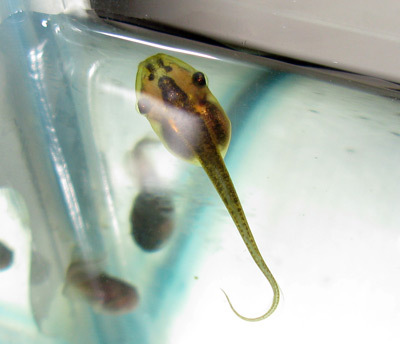 If you wish to save your tadpoles I’d just put them in a non-metalic container and fill with de-cholorinated water. Rainwater is ideal and feed them boiled lettuce. Don’t feel bad about hosing some away. Many of those puddles I spoke of dry up before the tadpoles can morph. That’s just nature. You can’t save them all. Better to raise up a few strong healthy ones than cope with an overcrowded dish. You don’t need to put leaves in the water. 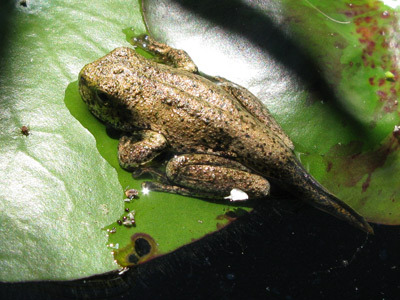 In the wild tadpoles feed on decaying leaf litter and algae and hide beneath the leaves. They must be from non toxic plants though. 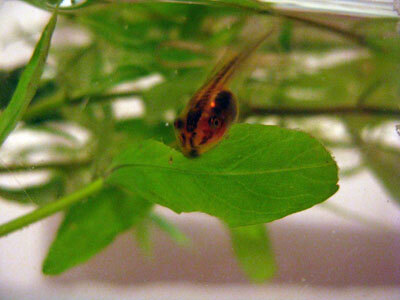 I often buy some aquarium plants that fish like to eat – they also give some cover for the tadpoles. I bought the book Raising Native Frogs Book, Written by Alastair Bax a long, long, long time ago and found the advice there wonderful :-). I even constructed some frog nurseries for my morphs, fattened them up with moths and flies (I became quite good at catching food) before releasing the little frogs back into the garden. My kids were very young then and it was the first time we witnessed frogs catching and swallowing their prey. We found them fascinating! Ps. The water there in at present is hose and rain water. Once the chlorine from the tap water has gone you can put the tadpoles in the tank. Tap water left out in the sunshine usually ages and loses it’s chorine pretty quickly – after 1 day it should be fine. You can buy drops for removing chlorine from tap water from Aquarium shops and sometimes supermarkets which will hurry up the process so you can add the water to the tank straight away. Make sure the tank has some protection from full sun. You don’t want to cook your tadpoles. It is also a good idea to change some of the water to remove waste. How often depends on the amount of water in the tank and number of tadpoles. Sorry to bother u again , but do u think a filter is needed ? 1. I wouldn’t bother with a filter. 2. 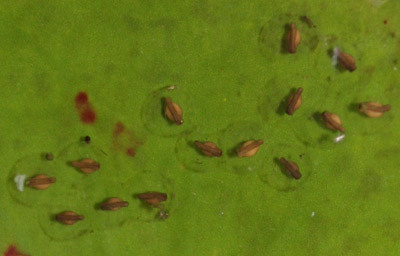 Fish flakes are not great food for tadpoles. They will eat them though. I find the best food is boiled lettuce. I use algae tablets if I have no lettuce. Take the green outside leaves off an ordinary iceberg lettuce. Wash them really well to remove any traces of chemicals. Boil them gently in a saucepan for about 10 minutes to break down the cell structure then drain and cool. I make loose balls of lettuce the size of a small marble and put them in a plastic bag in the freezer. 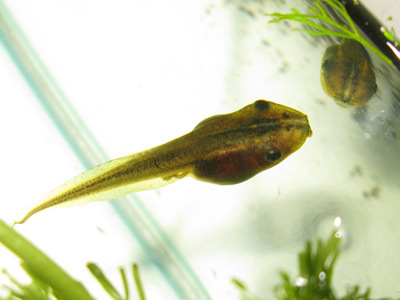 Place a frozen ball in the tadpole tank each feed but do not overfeed or you will foul the water. Am I perhap stressing too much . ?? The tadpoles I have outside like to hang at the top too. Don’t worry. So long as the water is clean all should be OK. Enjoy watching them grow and change. It’s certainly a rewarding and fascinating experience for us frog lovers. Hi sue , we have had the FROGS outside now for over a were. Each day more and more are leaving the pond. Last nite we came out as we heard a bloody cat in the yard. Anyway there was a big frog there. Just wondering would an older frog eat the baby frogs ? Sorry once again for asking ur opinion. Sorry I did not answer your previous question but your little frogs have obviously found their way out of your pond. Big frogs will eat anything they can fit into their mouth and that, I’m sorry to say, includes little frogs. Not much you can do… just hope many of the little fellows make it. Cats are a problem at night. We keep our feline friend indoors once the sun goes down. The sound of a squealing frog is rather strange and will sometimes make pussycat drop the frog. hi i was wondering if anyone knew of a park or pond (please specify name and address of pond/park) where i could find TREE FROG adpoles, i would buy them but i figure it is cheaper and more fun to catch them.